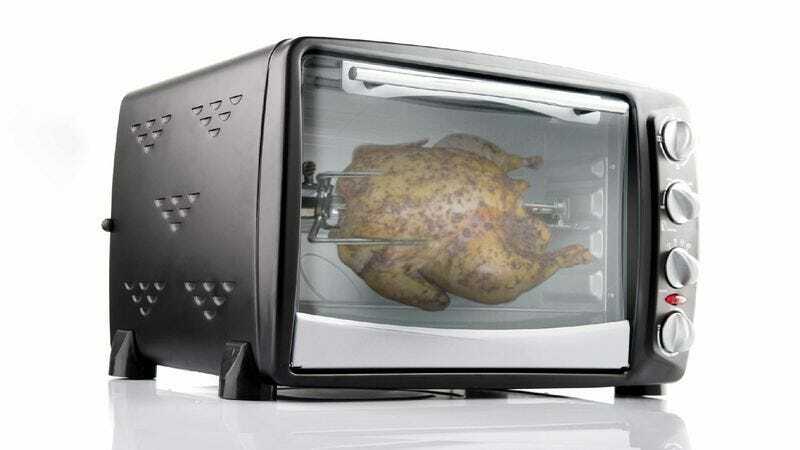 PASADENA, CA—Citing such cutting-edge advancements as integrated timers with automatic shut-off features, adjustable rotation speeds, and exterior handles that remain cool to the touch throughout cooking, a report released Tuesday by researchers at Caltech confirmed that home rotisserie technology is the only industry in the United States that continues to progress. “After extensive analysis of the nation’s manufacturing and high-tech sectors, we were able to conclude that American innovation is now exclusively limited to the development of countertop rotisserie appliances capable of slow-roasting as many as three full chickens or up to a 15-pound turkey in the convenience of one’s own kitchen,” said the study’s lead author Sara Pane, alleging that recent increases in U.S. GDP could be attributed almost entirely to the continued proliferation of fully dishwasher-safe rotisserie parts. “While American ingenuity has remained robust when it comes to producing restaurant-quality meat at home that browns evenly and retains its natural juices, we unfortunately can’t say the same about the nation’s mining, computer hardware, or motor vehicle industries.” Pane went on to warn, however, that ongoing advances in home rotisserie technology would be rendered largely irrelevant if the nation’s dipping sauce sector was unable to keep pace.